A tomato party that celebrates tomato season. 1. Place the sunflower seeds, stock and milk in a saucepan over low-medium heat. Simmer for 25 minutes or until the sunflower seeds are soft and most of the liquid has evaporated (Note: If the seeds are soft and you still have liquid, strain first before blending). 2. Add the seed mixture, lemon juice and olive oil to a blender and blitz to a smooth paste – if too thick, loosen with a tablespoon of water and blitz again. Season with salt and pepper and set aside. 3. Preheat oven to 180C. 4. 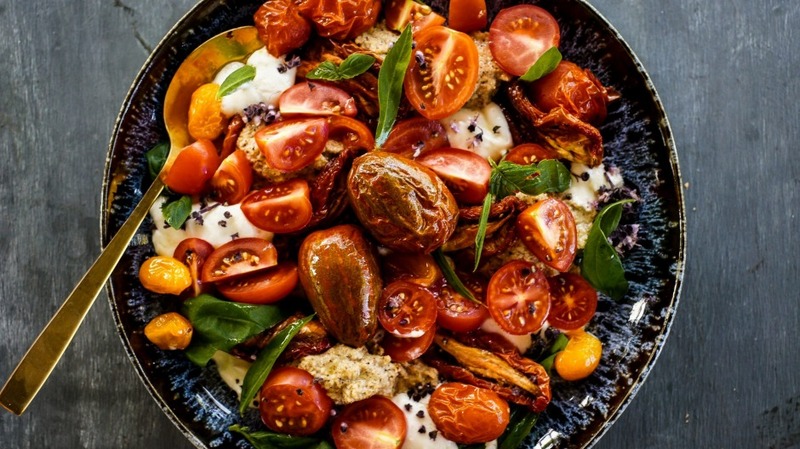 Place the medley tomatoes on a roasting tray with the olive oil, season with salt and pepper, and toss to coat. Roast for 15 minutes or until the tomatoes begin to burst. 5. While the tomatoes are roasting, add the whipped feta ingredients to a blender and pulse until creamy and smooth. 6. Place blobs of sunflower seed puree and the whipped feta on a serving plate – it doesn't have to be neat, just make pockets of flavour over the base of the plate. Top with the fresh, roasted and sun-dried tomatoes, season with salt and pepper, scatter with basil leaves and serve immediately.